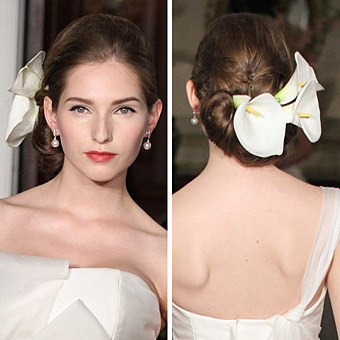 What can be more romantic than flowers in a bride's hair? 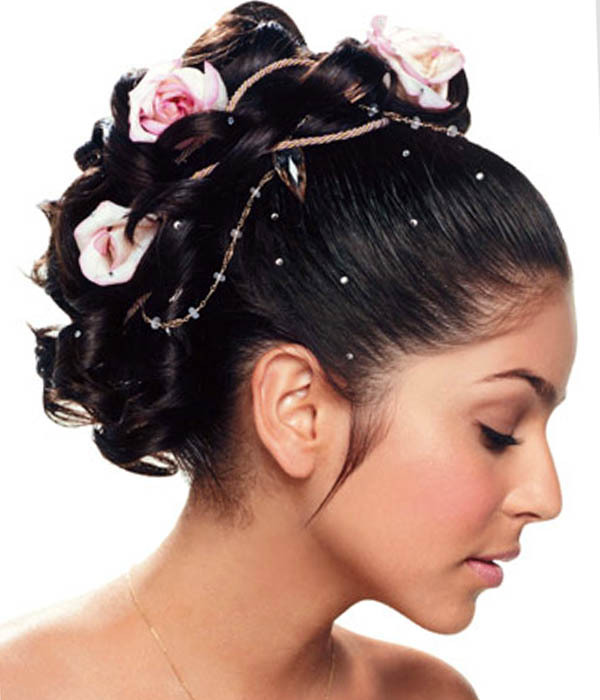 You do not necessarily need sparkles or any complicated hairdos as the flowers itself will make you look bridal and beautiful looking. 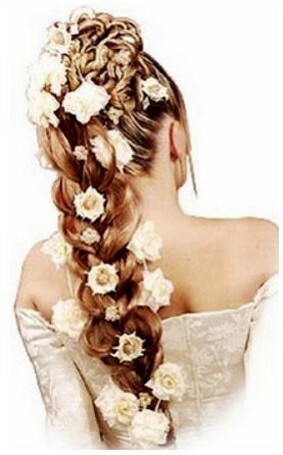 The tradition of decorating your hair with flowers dates back to the 1800s. 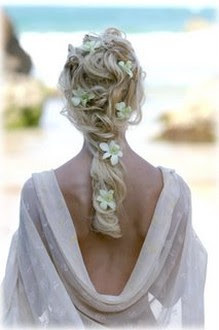 In the 60s, girls wore flowers in their hair to portray their connection to nature and symbolize love, innocence, and divine beauty. 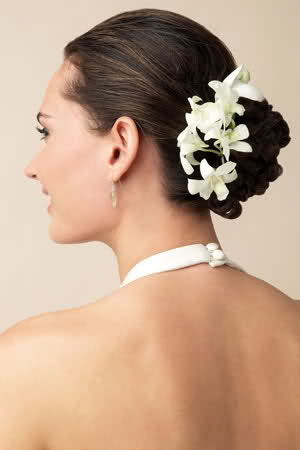 Nawadays especially for bridesmades and flower girls is common to wear flowers on the wedding day. You can use both natural living flowers or a "fake ones". 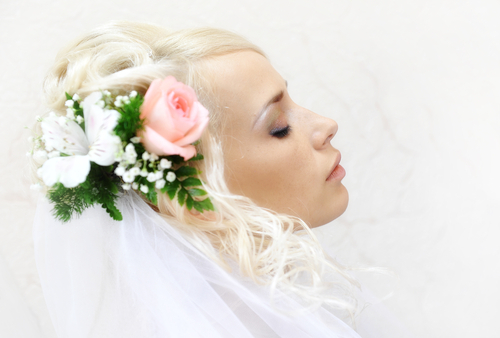 Flowers could be perfect accessory especially for those brides which decide no to wear a wedding veil on their wedding or want to take the veil off after wedding ceremony is over. There are numerous possibilities of different kind of flowers with different shapes and colours. So it won't be hard to achieve unique bridal look you want. Of course the fake flowers are most easy to wear. They will stand well at any type of weather, won't fade out and can be worn after the wedding. 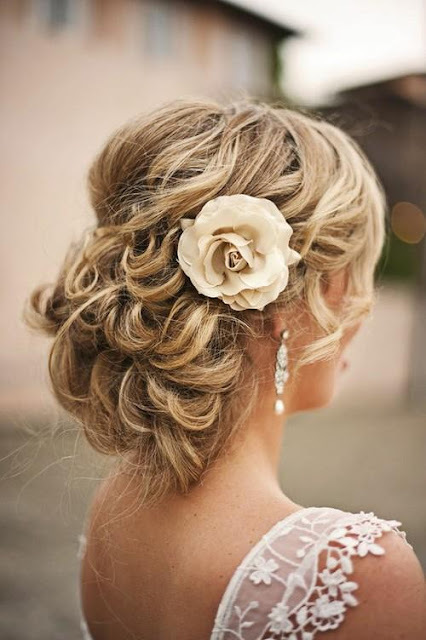 But if you choose to have real flowers for your wedding updo i would suggest to talk with your florist and ask for those flowers which will stay the longest looking fresh and beautiful. Long lasting and good looking flowers for example are orchid , plumeria, gardenia, peonies, stephanotis, lily, baby's breath, daisy, freesia, wax flower and of course can't forget about roses. I would suggest you to be very careful especially with lilys as they can have a very strong odour. How to keep flowers lookig fresh? 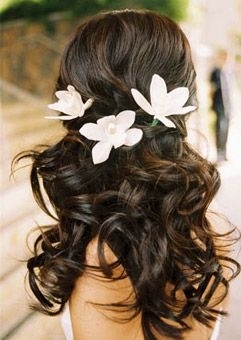 Store the flowers for your hair in a refrigerator or cooler until you are ready to use them. 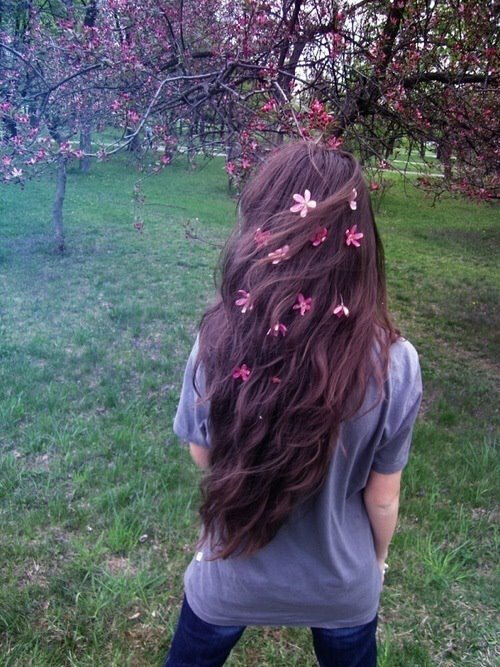 Mist your hairstyle with hair spray for the final time before attaching the flowers, as the alcohol and polymers in hair sprays can damage delicate blossoms. 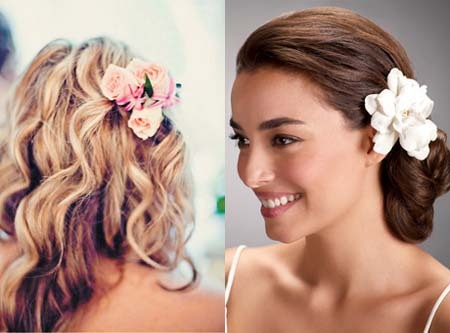 To wear a large bloom, like the cymbidium orchid, cut stem to one inch; pierce it with a U-shape hairpin, and insert the pin into the thickest part of the hairstyle. 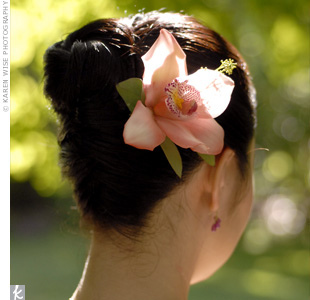 Small individual blossoms, such as stephanotis, can be attached with a small beaded hairpin, pierced through the flower's center and stuck into the hair. 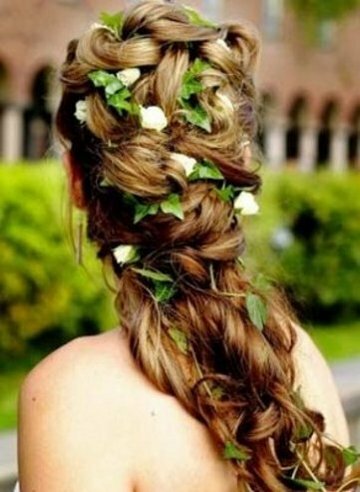 This one isn't actually a bridal hairstyle as such, but i think it gives nice idea how to decorate your hair for the wedding day. You don't actually need to have much of a hairdo if your hair looks healthy and beautiful by itself. 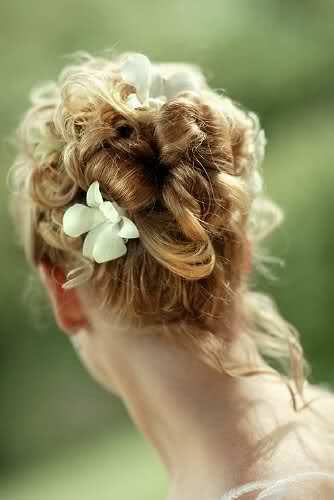 Just decorate it with little flowers to get the soft bridal look. Im wondering what the designer of the dress in the 8th picture is. 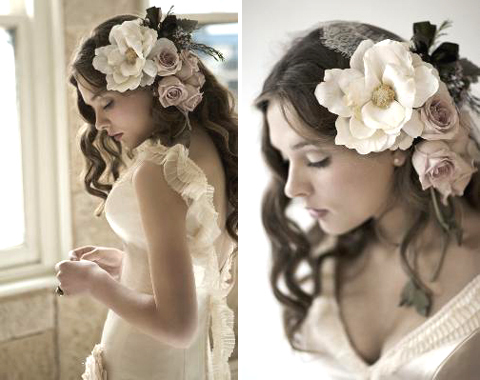 The side picture, with a variety of flowers, girl with dark hair, dress with lace and ruffles. . . Looks beautiful! But cant find it when I try to google it. Photo #27 from the start of the example photos: Ponytail with large flowers at base and silky strands that look like vines down the back. This is exactly how I want my hair to look for my wedding. 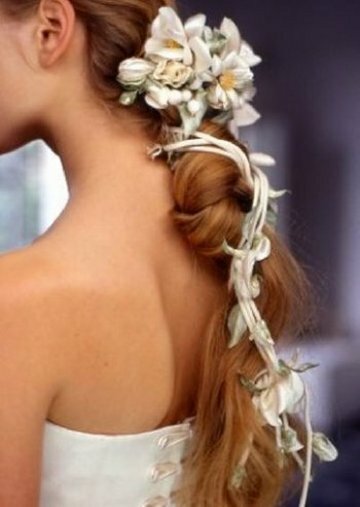 Where can I find this hair accessory? Hi LMGkaraoke! If it is still relevant, please contact me on my fb page. I make custom accessories and will try recreating something similar for you if you'd like. 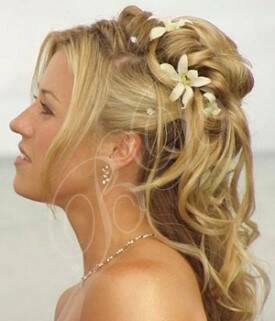 These all hair styles are surely fabulous and I think that the floral hairstyles are a great idea to provide a natural look to the bride. From all these styles, I like the third one most. It is simple and elegant. 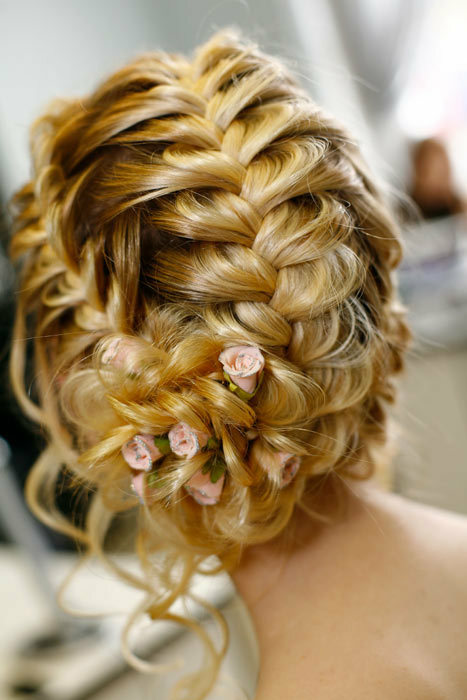 I am fascinated with these hairdos. All the hair styles are amazing. 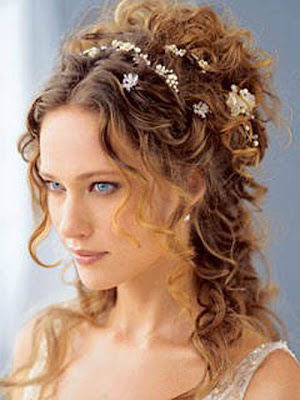 Using flowers in bridal hair styling is really a very good idea. 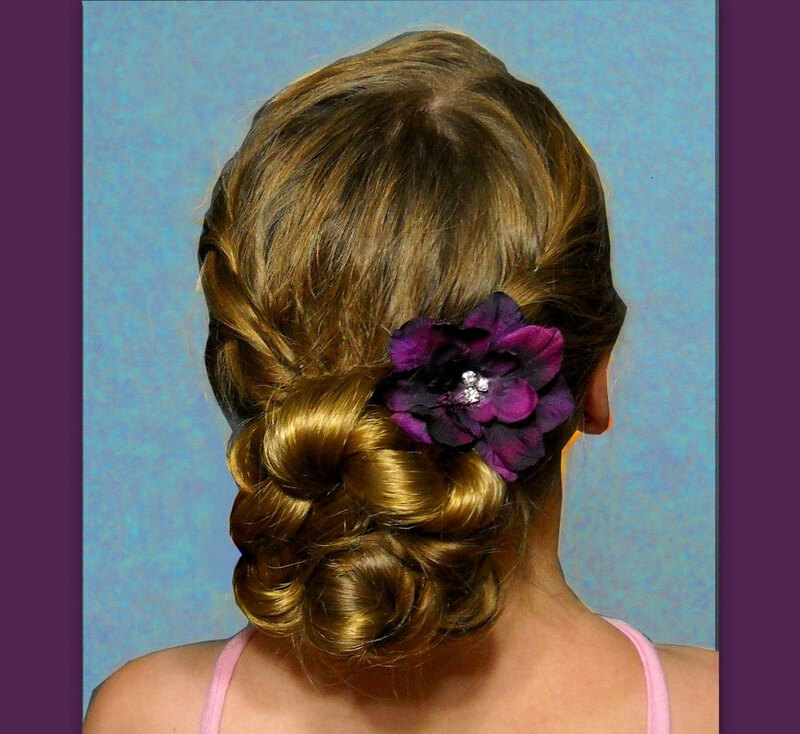 I would like to try this and show these hair styles to my clients. Thanks for creating such a nice blog. 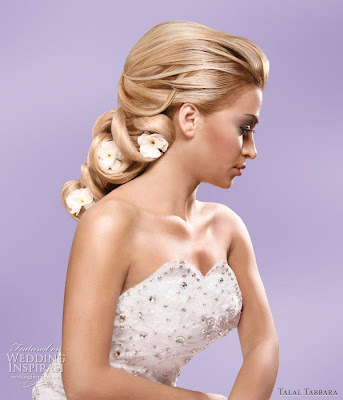 Wow, what an awesome collection of Wedding Hairstyles, you rock. I'm glad i stumbled into your site. I wanted to write you a very little remark to help thank you very much as before on your incredible principles you have shared above. It is so shockingly open-handed with you to allow easily all numerous people could possibly have sold for an e book to generate some dough for themselves, most notably considering that you might well have tried it in case you desired. The techniques in addition worked to provide a fantastic way to fully grasp that other individuals have the same eagerness just like my personal own to figure out lots more regarding this matter. I know there are several more pleasant sessions ahead for individuals that read through your blog. 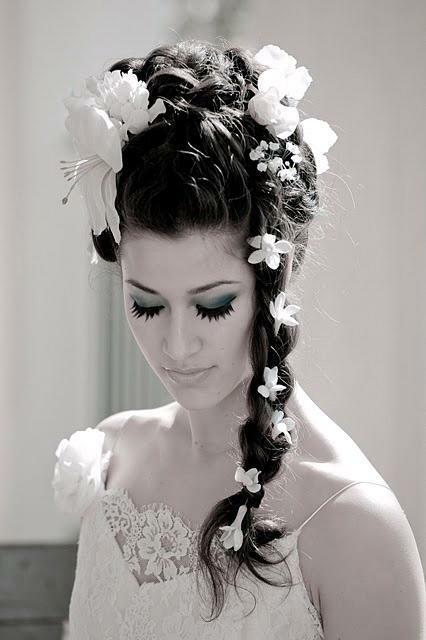 visit my site Long wedding hairstyles 2014. Outstanding post! 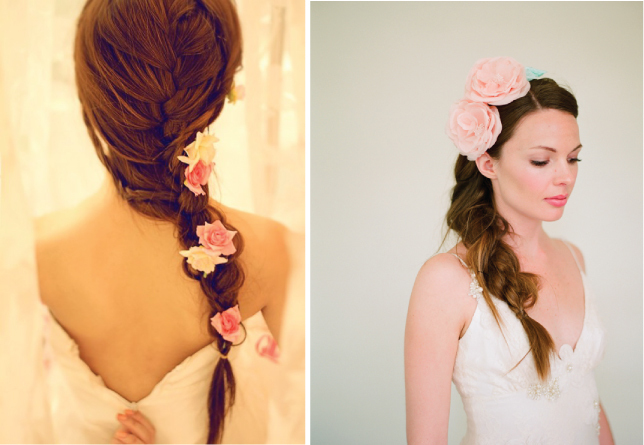 Just loved all these wedding hairstyles with flowers. Going to have one of these hairstyle on my wedding. This will look awesome with flower decoration of the place and I will try to book one of best Florist Delivery services that gives fresh flowers for grand events. I like the valuable info you provide in your articles. I will bookmark your blog and check again here regularly. 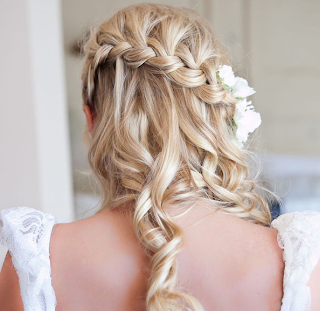 I am quite certain I will learn Cute wedding hair styles! Good luck for the next!” For more info look at this site.